A few doctors both in Medicine and Dentistry ask, 'what is Oral Medicine?' What are you doing? A few people ask, Does Oral Medicine means? giving Medicine orally? A few administrators ask how exactly Oral Medicine should be accomodated in the Dental College, what are their responsibilities? A few people of social organizations ask - Do the Oral Medicine expert have any responsibility in community service? A few scientists and researchers are doubt whether there are any research aspects in Oral Medicine. 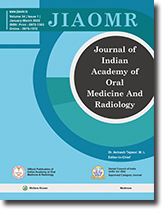 The glory of "Oral Medicine and Radiology - A recognized speciality by the Dental Council of India", (ever since the syllabus was formed) and the charm of services both in academics and society by the Oral Medicine experts have not been properly understood by a few sections of people. Hence, details of this speciality have been written here under 9 headings as NINE GEMS and the yeomen services of Oral Medicine and Radiology experts are explained as the TEN COMMANDMENTS in this article. I request my colleagues and my students to speak loudly, explain politely and make the people understand our speciality and our responsibility to the community at large. Mast cell, the MASTER CELL has derived its name from the 'overfed granules.' Mast cells are derived from bone marrow and are granule containing cells. Their distribution is preferentially about micro vascular bed in connective tissue environment. These cells help in maintaining the nutrition of connective tissue and are considered the sentinels of innate immunity. They function as gate keeper cells and are implicated in many biological processes. Mast cell population is now recognized for its immunoregulatory properties. This review is an insight into two facets of mast cell: Mast cell in Health & Disease. In spite of heightened education and prevention strategies, tobacco use remains a major health risk. Nicotine is believed to be the primary reason why people consume tobacco products despite the many negative health consequences. This paper discusses the various aspects of nicotine addiction. Dens in dente are developmental malformation resulting from invagination of the crown before it is calcified. This anomaly is most frequently found in the permanent maxillary lateral incisor. Three cases, one of radicular and two of coronal dens in dente are reported. A large bony swelling in the region of body of maxilla with extension to nasal, zygomatic and palatal region suspected to be a malignant tumor or aggressive benign tumor is clinically recorded and investigated. Conventional radiograph of skull reveals that a radiopacity in the region of body of maxilla obliterating the maxillary antrum with areas of radiolucency. The radiopacity extends to nasal, zygomatic, palatal and lateral wall of the nose. Computerized Tomography image revealed in both coronal and axial view, a well-defined soft tissue mass with areas of calcifications. The mass extended to the base of the skull towards the lateral part of the sphenoid sinus. The margins are well defined and not infiltrative in nature. Biopsy revealed that it was a cemento-ossifying fibroma. Thus a swelling clinically appeared as malignant tumor was diagnosed as benign tumor with extension to the base of the skull without any complications. The case is presented and discussed. Cheilitis granulomatosa is a rare inflammatory disorder of unknown origin. The clinical recognition of this condition is important as is the subsequent investigation by an appropriate specialist. Management considerations for these patients needs to take into account the results of investigations, the patient's expectations, and the severity of the condition. The multiple causes and clinical features of Cheilitis granulomatosa have created a confusing maze through which the clinician must carefully proceed in order to develop an accurate diagnosis and to provide effective treatment. The purpose of this article is to describe two cases of Cheilitis granulomatosa, highlight to the general practitioner the importance of differentiating this condition from other lip swellings. Hemangioma is an abnormal proliferation of blood vessels that may occur in any vascularized tissue. Considerable debate exists as to whether these lesions are neoplasms, hamartomas, or vascular malformations. Hemangiomas occur most often on the skin or in subcutaneous tissue and localized to a single area, but multiple hemangiomas may occur in a single individual, known as hemangiomatosis. Rarely, such hemangiomatosis associated with a variety of pathologies of other organs are seen in Rendu-Osler-Weber syndrome, Sturge-Weber-Dimitri syndrome, Klippel-Trenaunay-Weber syndrome, Maffucci syndrome, von Hippel- Lindau syndrome and Kasabach-Merritt syndrome, which are believed to be within the spectrum of hemangiomatous disease. Hence we report such a rare case of hemangiomatosis seen in a 13 year old boy in association with Klippel-Trenaunay-Weber syndrome. Osteitis deformans or Paget's disease of bone, fondly referred to as the 'collage of matrix madness', is a unique skeletal disease characterized by furious osteoclastic bone resorption followed by a period of hectic bone formation, resulting in again in the bone mass wherein the newly formed bone is disordered and architecturally unsound. A disease of obscure etiology, it usually manifests as progressive enlargement of one or multiple bones of the skeleton. Herewith we present a typical example of a polyostotic form of Paget's disease with classical clinical features and radiologic changes in one patient and a subclinical form of Paget's disease with marked radiological changes in the other patient. Regional Odontodysplasia is a rare developmental anomaly with unknown cause affecting ectodermal and mesodermal dental layers, affecting segment of jaw more commonly maxilla. A case of regional Odo-todysplasia was reported in a 13 year old patient in whom maxillary right segment was affected. Teeth affected were central incisor, canine, first & second premolar with different grades of severity & lateral incisor appeared to be nonnal. Affected teeth were having irregular, rough & discolored surfaces, localized gingival enlargement, periapical pathosis, radiographically "ghost. tooth" appearance &. short roots. Additional features noted were impacted permanent canine & overretained deciduous canine in the affected segment. Progressive Hemifacial atrophy (Parry-Romberg disease) is a rare condition affecting the face. It commences in childhood but its aetiology and pathogenisis remains unknown, and is sporadic. The aim of this article is to report a case of Progressive Hemifacial atrophy. The characteristic clinical and radiologic features and options of treatment is discussed.